The Shakespeare blog contains up to date articles about Shakespeare’s works, his world, and his plays in performance. Started in 2011, there are now hundreds of posts to choose from, and in 2016 it was looked at over 230,000 times. You can browse by choosing a category from the list on the right. 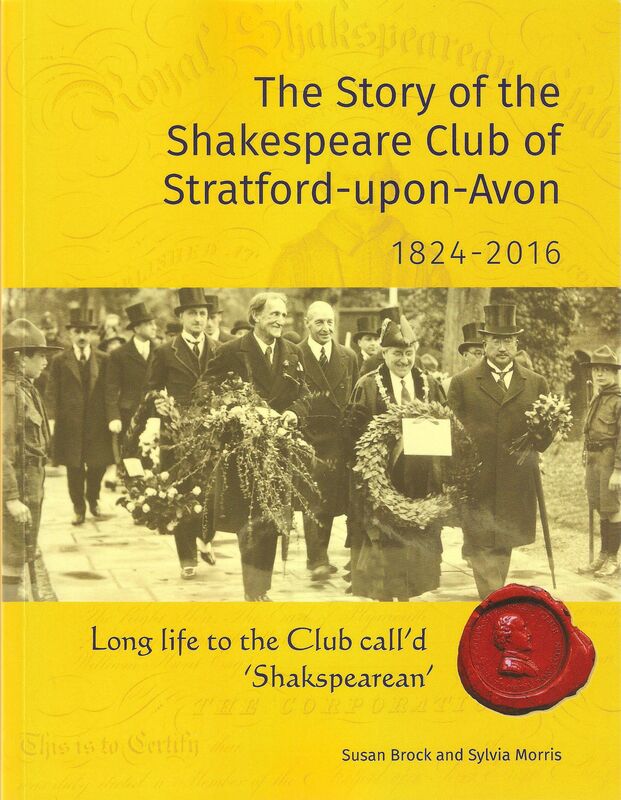 I’m particularly pleased to announce the publication of The Story of the Shakespeare Club of Stratford-upon-Avon 1824-2016, which I have researched and written with Susan Brock. It’s far more than just the history of the Club, telling the story of how Stratford became the worldwide centre of Shakespeare performance and celebration, and focusing on the people who achieved it. Click on the link to find out more. Listening to the Audience now contains links to a series of clips of audio recordings I’ve made on several productions of Hamlet as a first step in my project to gather memories of Shakespeare in performance. The Online Resources page contains information about some of my favourite Shakespeare websites, and you’ll find information about me, including projects I’ve been involved in, on the About Me pages. The site’s regularly updated and you can ensure you always get the latest posts by subscribing. If you have any comments or suggestions I’d love to hear from you. Delighted to have found this excellent blog. Wishing you a very happy New Year, and keep up the good work! In your blog Remembering the days of Empire: The Shakespeare Memorial National Theatre Ball, 1911, 27 October 2014, you have a picture of a completely different event that happened at the Royal Albert Hall. We had an event called The Shakespearean Show, in aid of the Chelsea Hospital for Women, 28-30 May 1884 in which they built a little village in the middle of the Hall featuring Anne Hathaway’s cottage and Stratford Church. It raised a lot of money for charity and I would be happy to give you more information about it. Dear Suzanne, Thanks for this wonderful information. I’d love to hear more about the 1884 event please. I loved the blog on stage armor. You might be interested to know that the Stratford Shakespeare Festival in Ontario, Canada also has an in-house armory that produces armor and weapons for its theatre. It does fabulous work – as does their costume shop. I’m researching the boy in this article, along with other Harbury casualties from the Great War, and although I can’t be 100 % sure if this is the same Malcom Gordon Bland in your blog a lot of the facts match. At the time of his death he was registered as living at Greenhill Farm, Harbury and is commemorated on the war memorial in the village. Can I ask where you sourced the picture of him from and if you have any others of him or that include him? These details sound correct for Malcolm Bland. I did quite a lot of work tying up loose ends as you’ll have seen in the post. His mother left Leamington after she was widowed which is why he is mentioned on the memorial in the village. Love reading your blog, it’s fantastic resource for studying and understanding Shakespeare. Would love to contribute in it. William Shakespeare: the spirit and the letter. Please add your translation in other languages to 2009zww@gmail.com. Thank you. Best regards, Wolkowski, Sorbonne Universites Upmc. hello Sylvia, Geoff Tristram here! The 400th anniversary Shakespeare oil painting that I created will be auctioned at Fielding’s, Stourbridge on the 2nd of september. Catalogues available later this month. Thank you for helping promote the picture back in 2016, and would you mind letting as many people as you can know about the auction. Fielding’s is owned by Will farmer of the BBC Antiques Roadshow, a lovely chap! Dear Geoff, This is great news. Very good luck with the sale!